The diversity of Scottish landscape enchants visitors from around the world. Taking a self-drive tour of this country provides the greatest opportunity to see all the sights the traveler wishes. Each individual, family or group can design a trip to fit their interests and the amount of time they have to travel. A self-drive travel guide is especially advantageous in Scotland. It is often difficult to judge the distances between sites and accurately calculate driving times. A good guide will provide this information making it easier to plan a trip that includes all places of interest. Begin a driving tour in Edinburgh or Glasgow, heading north to famous Loch Lomond, while enjoying the scenically beautiful Argyll. There one can visit the Thistle Bagpipe Works to see how these unique instruments are made. From the small fishing port of Oban it is easy to explore the Isle of Mull. A boat trip to Mull, Iona and Staffa leaves from Oban Harbor and is considered one of the best British day tours. Mull has ancient castles, perfect beaches and Tobermory—a town known for its brightly painted buildings. A ferry takes visitors to the Isle of Iona for a visit to its sacred abbey. On Staffa, famous Fingal's Cave inspired Mendelssohn's "Hebrides Overture." On the mainland, Glenfinnan Monument was dedicated to Bonnie Prince Charlie at Fort William. The Fort lies in the shadow of Britain's highest mountain, Ben Nevis. The traveler can enjoy a day trip on an antique steam train. From there take the Road to the Isles and ride the ferry over to the mystical Isle of Skye. This is the most scenic and largest of the Hebrides islands. Majestic mountains, gardens and castles, and its own distillery make this island a "must see" destination for travelers. The road then leads to Scotland's most photographed structure—Eilean Donan Castle. The mountains of Kintail Loch Ness lie to the east and Wester Ross provides awesome scenery on the way to Inverness, the capital of the Highlands. A day trip by Kessock Bridge takes the traveler to a peninsula, Black Isle, covered in various shades of green. Forest treks and country roads there are perfect for exploring. The area includes bird preserves, Mulochy and Udale Bays, with dolphin viewing from cruises leaving Cromarty. Outside Inverness travelers can visit Culloden Battlefield, the megalithic chambered cairns, standing stones and carved Celtic Pictish stones that embody Scotland's past eras. To the east are Culloden Battlefield and Clava Cairns, burial mounds dating back to 3,000 B.C.E. Each of three round chambered cairns is ringed by stones from the same era. The route through Braemar and Royal Deeside toward Perthshire brings visitors to Balmoral Castle and Crathie Church, the highland residence and church of Queen Elizabeth. The winter ski area of Glenshee is also along this road. Then travel south to Edinburgh through the lush countryside of Perthshire. A panoramic Edinburgh tour on local busses will familiarize the traveler with the city, helping him decide the sights he wants most to visit. 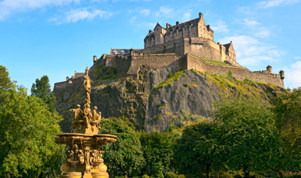 Edinburgh is renowned for the Edinburgh Tattoo, Edinburgh Festival, Holyrood Palace, the Royal Yacht Britannia, Edinburgh Castle and nearby Rosslyn Chapel made famous in the "Da Vinci Code." Local shops provide unique souvenir shopping experiences. An alternate routing allows visitors to stay at St. Andrew's, named for Scotland's patron saint. The cathedral was once Scotland's most magnificent, but now is only an impressive ruin. St. Andrew's Castle affords visitors the opportunity to walk through moss covered, damp tunnels to the structure's dungeons. Today St. Andrew's fame comes from its golf course which has been in play since the 15th century Watch the play on the course or go fishing with the locals from the village of Fife. Various distilleries along the Speyside Malt Whisky Trail give tours demonstrating how their variety of whisky is made. Southeast from that road lies the beautiful Deeside Castle Trail. The stunning ruins of a cliff-top castle have been utilized as the backdrop for many films. Farther south, travelers through Perthshire come to Stirling Castle. A stay in Glasgow permits guests time to visit Kelvingrove and other art galleries, fascinating museums, enjoy the Willow Tearooms and the home of Charles Rennie Mackintosh. Those of Scottish lineage can do some online research prior to their self-drive tour and map their own Heritage Route. They can include visits to the villages and even the homes of their ancestors. Edinburgh's New Register House contains the most accurate registry of Scottish heritage anywhere. These can lead one's research to parish records and census reports for further names and places. This type of tour is unique to each family. Scotland's verdant hills and mountains also provide great side trips to hike or mountain bike. These afford opportunities to get out of the car and enjoy some scenic exercise. To find Scottish heritage tours click here.